Children and their feet grow so quickly that it may feel like you blink and they've already grown out of their new shoes. As with the rest of a child’s body, the feet are continually changing—transforming themselves into the feet that will carry your son or daughter through their adult lives. Your job as a parent is to be as vigilant about the health of your child's feet as you are about their teeth, heart, and other parts of their body. Taking care of issues before they become problems gives your child a chance at full recovery and the hope that a foot or ankle condition won’t follow them into adulthood. When we are born, the bones in our feet our tiny and underdeveloped. Those bones grow in over time. A baby's feet look different from adult feet, so do not automatically assume your child may have some kind of birth defect if his feet have an odd appearance to you. 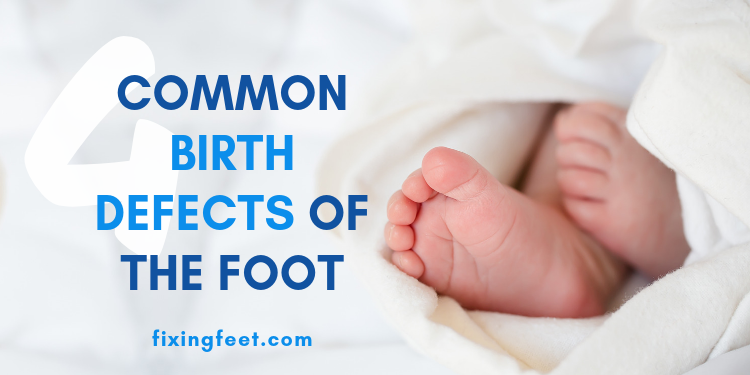 There are, however, some common birth defects of the foot found when a child is born. Clubfoot. Clubfoot is more common than you would imagine: one in every 1,500 births will have some kind of clubfoot. This means that the foot is pushed inward and upward in relation to the leg. The level of flexibility in the clubfoot can vary. Metatarsus adductus. Usually affecting both feet, this is when the front part of the foot turns in. Do not confuse this with being pigeon-toed, which is a leg rotation issue. Overlapping toes. This is so common in newborns that it isn't really even considered a major issue. Most times this condition will fix itself without special treatment. Webbed toes. Webbed toes are a cosmetic issue more than anything else because it just means that there is no real space between two toes. If you suspect your newborn has a birth defect of the foot, don't try to self-diagnose in this case. Have one of our experienced podiatrists evaluate your baby so that you can get a professional opinion and treatment plan if necessary. We also know that active children are prone to broken bones, sprains, and fractures — and our doctors are experienced in treating all of those conditions as well. We welcome children at Fixing Feet Institute and love seeing parents take initiative when it comes to the health of their child's feet. We will work hard to diagnose and care for your son or daughter so they can enjoy a lifetime of good health in their lower extremities. If you would like to schedule an appointment, simply call our Arizona podiatry clinic at (623) 584-5556 or e-mail us at [email protected].